Some interesting stories from DigitalDaily / WSJ on the changes at Google, now that Larry Page has resumed the CEO role there. The main theme that seems to be emerging: An elimination of Google’s more centralized functional structure–where Rosenberg was one of several manager kingpins–to one in which the individual business units and their engineers, such as its most independent Android division, rule more autonomously. Certainly, a fully centralized and functional structure can have serious drawbacks in a company as large as Google has become. With a lack of business accountability, pet features can crowd out high priorities, decision making becomes slow and responsibility for line-of-business success is defuse. Having lived inside a large uber-functional company myself, it is not hard to see some downsides. However, the other thread here is the primacy of engineers over managers. Engineer supremacy is a fashionable meme at present, not least because FaceBook (a 1000 person company) is practicing it to considerable effect. I find it appealing, too – often, you get the best results by making the people creating the product responsible for getting it right. The solution is real, specific, strategic understanding at the senior levels, albeit open to the ideas bubbling up throughout the organization. Even as a company gets big, it still needs to choose its key bets with great care – there can be only a few of them – and pursue them with powerful focus. A business unit organization may help, but it can’t solve the problem if the problem is a lack of strategic direction or strategic prioritization. Comscore have latest market-share numbers for U.S. smartphone market. Despite its successful iPhone rollout at Verizon, Apple is stalled at 25% market share, and under attack from Android. Indeed, we can assume that, but for Apple’s efforts at broadening the iPhone’s distribution via Verizon, Apple would be losing market share; it seems almost certain that the iPhone is losing share amongst AT&T subscribers, which is as a good a measure of “exiting-store sales” as we have. Of course, this trend has been coming for a while. In this blog post (“Mid- and Mass-Market Smart Phones“), we looked at whether there was a mass-market play for Apple in smartphones without them sacrificing their quality positioning and margins. I still think the answer is “yes” – Apple can, and perhaps may, expand its iPhone range to regain smartphone market share momentum. One positive here for Apple is the continued momentum of its platform (Cocoa / iOS). I continue to hear from developers that developing for Android is “a pain”. Fortune had an article on the negatives for Android just yesterday. Meanwhile, the iPad continues to sweep all before it in terms of Tablet sales, and also in terms of being the target for anyone creating a tablet app. 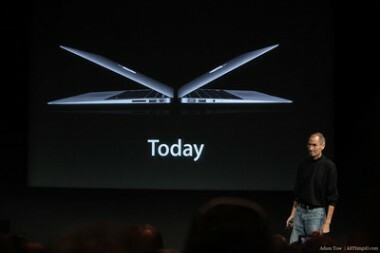 The MacBook Air is also creating a new niche of tablet-like-portability-with-laptop-like-flexibility (see for instance Digital Daily on the MacBook Air as Quasi Tablet); and, given the introduction of the Mac Store and the huge and increasing similarities between iOS and MAC Cocoa, the Air is part of Apple’s portability-platform, too. Platform success means the best apps, and the best mindshare from both consumers and developers. If Apple can find the right way to tackle the mid-market, and continue to broaden distribution in the U.S. and internationally, they could yet win the lion’s share of the smartphone market, even in the face of would-be imitators based on Android. Fun tech crunch piece on CEO psychology. And to rub salt into the wound and make matters worse, it’s your fault. I enjoyed the article, but didn’t feel quite the same way about being a CEO. The “soaking up the stress” part never seemed too difficult. In fact, being CEO is arguably the least stressful job in the company – because you have more opportunity than anyone to address problems, and are less required than anyone to put up with them – though of course the CEO will see plenty of issues they have to live with, too, just because some challenges are too low priority to be worth going after immediately. Having to live with a wrong call that negatively impacts people can be stressful. However, I think most CEOs have a “nobody’s perfect, you just play the percentages” kind of attitude that allows them to live with their own bad calls. And more often than not, as things go wrong, you can recalibrate in any case. The one thing I do think is difficult is the time lapse between changes and their effect. For instance, suppose you have an engineering team that has gone bad. It might take 6 months to rebuild the team, then another year to rebuild the product. During all that time, you have to keep yourself interested in the problems, motivated to solve them, and you have to find ways to survive the fallout until the problems are finally dealt with. Plus you have to keep the team and the company positive, while those 18 months pass slowly by – perhaps with a background of customer complaints, partner frustration, and so on. That is a psychological challenge. But I guess for me the psychological of other people – employees, customers, partners, and other stakeholders – always occupied a lot more mental space than personal stress. Amazon have recently launched their “music in the cloud” service. And Fred Wilson has a short post, saying that subscription/streaming services are the way of the future for music – not stored music, even if the music is stored in the cloud as with Amazon’s service. Streaming makes intuitive sense in the long term. With a well-stocked streaming service, you could listen to whatever you wanted. Payment could calibrate to your level of enthusiasm for individual pieces – some you listen to just once, some dozens or hundreds of times. You could access the service from any mobile or Internet-connected device. And some services – Spotify, Pandora – have already achieved good traction with music streaming. So – why isn’t everyone streaming music today? Part of the reason is certainly the legal / licensing / business-model challenges. Such challenges are the primary reason why Spotify is not available in the United States, for instance. Yet there is are additional reasons for the continuing dominance of owned, downloaded music. Simply put, a high-quality user experience is easier to guarantee when music is stored locally. There is no risk of streaming interruption, or of being unable to connect – not least, when traveling – which is important because music can be an accompaniment to other activities, giving it a high need for ubiquitous availability. “My music” is unambiguously identified, because I bought it and downloaded it, or at least copied it. I can do what I like with my own music collection, which in the end is just a collection of files. And CDs, live recordings, and other media are all easy to convert to the common format of a digital MP3 collection. Plus, music is a many-repeats experience. For instance, I bought a couple of Gaslight Anthem albums 6 months ago, and enjoyed them; I can see in iTunes that some of the tracks on those albums have played 70 times in the last 6 months (geeky, I know, but there we are). In this way, streaming music is very different to books, TV shows, or movies, none of which would be repeated 70 times in a lifetime, never mind in 6 months. Internet radio, including personalized radio stations, could be a near-perfect substitute for conventional radio. And I’m willing to believe that, because streaming is a superior technical solution, it will eventually displace fully-local storage of a person’s music collection. Or perhaps some kind of hybrid, with caching, will emerge. Nonetheless there are user-experience and user-behaviour artifacts that make music slower to move to a pure-stream delivery model than other forms of entertainment, even before you get to some of the legal/business challenges. Evernote is an application for MAC, Windows, Android, and iOS. It lets you make notes and “clip” web pages and other documents you might want to come back to. It is very searchable. It has a revised version, just released. I started using Evernote a few months ago. I like it (*) and would happily explain its benefits, but, though I still use it occasionally, I find that I return to it less and less. It seems that this is the fate of many well-conceived and well-implemented applications – despite their positive qualities, they do not integrate themselves into our daily lives, and gradually drift out of use. Given that the apps rely on advertising support – or else freemium-to-premium paid upgrade, as in the case of Evernote – they need to stay in use if they are to succeed. Some apps or websites achieve their “keep-going-backability” by addicting the user to interactive behavior – especially social behavior – FaceBook being a key example. Others aim for simplicity, and try to serve a need that you have many times a day (Google search). Another method might be to hook people on a repetitive narrative, like a TV soap opera – though this seems less common in tech, unless you argue that viewing Twitter-feeds, or reading Internet news, is analogous, being forms of Internet-based repetitive entertainment. Similarly, games can be addicting. The fact is that the number of apps or web-sites that can “hook” the user in this kind of way, and so become habitual and entrenched in the user’s day, is probably not more than 7-9 per person. So one of the things that we are discussing most intently as we brainstorm new startup ideas is – how do we achieve that “keep-going-backability” that makes the difference between success and failure? (*) Slight caveat on Evernote, I did have some bad experience with their Android app, which did put me off a bit, even though it is working now. Avoiding supporting too many platforms, not all of which work well, is another, rather more humdrum, lesson. Most of us have already either connected or reconnected with all the folks we know online, and the next evolution is for services to help us discover new connections. This element of discovery drives these services to help us build smaller networks around our core groups of friends and family, or to build newer networks with folks we don’t know yet but who have similar interests or location patterns. One key use case is a person moving to a new area. Are they most interested in “making new friends” in general, or do they want to find out about activities, how to pursue their interests in other words? In pursuit of interests, they may indeed make friends, whether online or in the physical world. I do think that manufacturing useful + interesting + relevant online – and especially mobile – experiences without requiring a lot of user self-curation is a core social-media opportunity. (*) Tech Crunch actually put some work into gathering all the different sources of data plus thinking about them… Not just the company-announcement-with-a-twist-of-snark model they sometimes fall back on… It really is a nice post. “Color” the localized-photo-sharing app, is all over the web this morning. They launched their app. And by common consent, it is pretty bad. They also raised $41m from Sequoia Capital. Every writer out there has declared that the only justification for such a large raise would appear to be the track record of the founders. How much of this makes sense? It may not be solely about the team. There may be more to “the idea” than a poorly implemented app or a poorly managed rollout. In Color, publishing a photo connects you to people in the same location as you, not just to your existing social network. I do suspect that one of the untapped online social opportunities is serendipitous new social connections – making new friends, in other words. Location is one promising way to look for new social connections, in part because to it is hard to “spam” – you at least know that you have a location in common. Taking a stab in the dark, I would guess that the Color team are looking to attack the “new social connection” opportunity over time, with a strong location bias, and photo (+video ?) being the initial hook. That has the potential to be quite valuable. How much of the $41m is simply an illustration of the old venture-investing rule that you invest in the team, not the idea? Some, no doubt. Yet, we could then ask – how come this high-octane team released an app that doesn’t cut it with users? It is tempting to wonder if the $41m became a problem, not an opportunity, at Color. Did the team release under pressure from their investors? For startups, taking such a large sum does create special concerns, particularly when taken from a top-tier firm like Sequoia that will be hungry for results. Practically speaking, it is usually right to take money while it’s available – doing multiple smaller funding rounds is nearly always more dilutive. Yet, if you do find a investor willing to make an outsize commitment, you need to be doubly careful to manage their expectations, and in particular to set the expectation that your company will develop gradually, just like a “normal” startup. The companies are suggesting that combining their networks will ensure better coverage, and that increased scale will enable them to roll-out 4G service more rapidly. Skeptics are more inclined to worry about reduction in consumer choice leading to lowered service quality and higher prices especially in the form of data-metering (pay-by-the-megabyte). Meanwhile, it is unknown if regulators will approve the deal, though AT&T are either confident or doing a good imitation of being confident. For startups, the main thing to remember about deals between large well-established companies is that they rarely change the landscape enough to make a difference – not when compared with the startup’s ability to drive its own strategy, its own appeal to customers, and the quality of of its own execution. In this particular case, there may indeed be some marginal increase in AT&T’s pricing power, making metered-data more prevalent. Service providers won’t be able to position 4G as useful without providing significant data allowances, so there is a limit to how aggressive they can end up being with data metering in practice. And Verizon in any case provides the primary competition to AT&T. Nonetheless, startups that are relying on unlimited cellular bandwidth “for free” – perhaps in some form of cellular video service – should beware; but that was already given the case, given the industry interest in metering. For almost all startups, “Keep Calm and Carry On” is the appropriate response to the AT&T+T-Mobile combination. Gigaom has commentary today on predictions for the iPad’s market share; they think that Apple’s share of the tablet market will be significantly higher than most analysts believe. They foresee a iPod-like market share (Apple dominates the music player market) rather than an iPhone market share (there are of course many active players in smart phones). The reason, they believe, is that the iPad is a “category defining” device. I think Gigaom is probably right about Apple’s prospective market share, but their reasoning seems dubious, or circular at best. Vice versa, the iPhone was the first smart phone to make full use of a pure-touch interface. You could call it the category-defining “touch phone”. Why can the iPhone not be considered a category defining product? The music player market exploded in size when Apple produced the iPod. Likewise, while the smart phone market was already growing by the time Apple entered, the size of the smartphone market (reflected in both Apple and non-Apple devices) has also exploded since the iPhone was introduced in 2007. There is some difference in the size of the pre-existing market, of course, but hardly enough to say that one device was category-defining while the other was not. Apple’s ability to hold on to such a large share of the iPod market has more to do with the weak quality of incoming competitors, whereas in the smartphone market – or the “touch phone” market – they have had to contend with competitors enabled by Google’s Android software. The other big reason for the superior share in music players is that Apple were able to produce a range of players, right down to the iPod nano, that protected them from undercutting. They have not done that in touch-phones, at least not yet. So why do I (like Gigaom) think that analysts are underestimating Apple’s future share of the tablet market? Simply, Apple’s product lead over competitors is great – it is like looking at the iPod vs. other MP3 players – not like comparing an iPhone with an almost-as-good Android phone. While Android might yet address the tablet market effectively, it has not done so to date. Secondly, Apple has been aggressive in pricing on the iPad – it is already trying to protect itself from low-end competition; and we might expect it to produce some lower-cost models in future to guard against creeping commoditization by cheaper devices. Many startups overestimate the importance of originality, and of creating a new category. Most often, a killer product perfects things that already exist to address a mass market effectively. Then a continuing lead in product excellence, together with protecting the business from attack by adjacent competitive products (especially lower-end products), is the way to maintain and extend the success. Rely on Third-Parties or Do-It-Yourself? …developers ask us if they should build client apps that mimic or reproduce the mainstream Twitter consumer client experience. The answer is no. There has been uproar amongst developers, on the grounds that Twitter has been successful in significant part because of innovations amongst third-party software providers. Even today, 42% of all Tweets come from third-party applications; now Twitter appears ready to cut the ground out from under the developers of those clients. By letting third-party clients proliferate, Twitter lost control of #2 – user experience – and made it much harder to monetize #3 – eyeballs. At the same time, that proliferation did create all kinds of innovation and allowed the service to scale while lessening the complexity and risks and costs of scaling for Twitter itself. Sometimes, that is a trade-off that is worth making. It is important to remember, though, that what looks like a great idea early-on – gaining leverage from third-parties – can seem a lot less smart if it makes it harder/impossible to scale a business three years later. Sometimes, indeed, raising more venture money and managing the organizational complexity of more employees, even early on, is in fact the best way to grow. My guess is that that would have been the case for Twitter, given how “hot” they were (and are) and their consequent access to capital on very favorable terms. As discussed in the last post, though, the “Let’s build it ourselves” approach would have required a lot more innovation and experimentation by Twitter, and perhaps they didn’t feel equal to that at the time. Even then, though, they could have thought-through the business-model implications of an open-API – for instance by taking a cut of all advertising revenue associated with the Twitter API. What are the lessons for the various startups that will be damaged by this change in attitude by Twitter? Building a startup predicated on the ecosystem of a single-company can be dangerous, especially if the company has yet to fully establish it’s own business model – in case the company decides its business model looks a lot like your business. If you are heavily dependent on one or two major players, try and be seen as a friend not an enemy. For instance, as Twitter pushes more advertising, third-party clients could look for ways to voluntarily support Twitter’s own advertising. In future, clients that are “a better mousetrap” than the Twitter client are probably unattractive startup opportunities. However, clients that might re-imagine social media, and/or spread across multiple forms of social media could still be very appealing. Twitter’s record to-date does not suggest that they will come up with the last word in social-media user-experience innovation. Comments Off on Rely on Third-Parties or Do-It-Yourself?